His name is Jais. He’s new to the Reece’s Rainbow family. He just turned 2 years old last month. 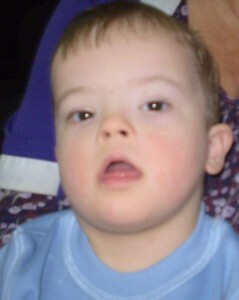 He lives in an orphanage, and he has Down Syndrome. I don’t know what country he lives in, but I do know that he needs a family. He needs to be loved in the way children are loved by their parents, which is not the same as the way nannies love the children in their care. He needs a mom and a dad, and I bet he’d love brothers and sisters. He needs a chance— a chance to learn and grow and become his fullest self. For all those things to come about, he needs to be adopted. A few weeks ago, I signed up to be this sweetie’s Angel Tree Warrior, committed to raising $1,000 towards his adoption grant, which will help his forever family with the expenses of adopting him. So far, I’m lagging way behind. On this Giving Tuesday, will you help little Jais? Click his name and make a donation, or mail a check (saving PayPal fees) to Reece’s Rainbow, PO Box 4024, Gaithersburg, MD 20885 and put his name in the memo line. If you donate $35 or more, you’ll receive a beautiful ornament with Jais’ photo on it to hang on your tree. Maybe with a higher grant, Jais will find his forever family faster, and won’t spend his most formative years in the orphanage. Every dollar makes a difference.